This matter was challenged at the meeting of Cork County Council held on 23rd April 2018. The Notice of Motion related to the recent bombing of Syria, the situation in Gaza and the use of Shannon Airport by the US military, see the full motion here. That a mere suggestion from the Mayor was sufficient to exclude a Notice of Motion. I was not consulted on the matter – Standing Orders (18 and 21 were referenced) require that any member proposing a motion that may be excluded, or referred elsewhere, must be consulted. It is difficult to see how the subject matter of the motion was inappropriate for full Council yet proper for a Divisional meeting. An arbitrary decision was made to censor discussion at Council and proper procedure was set aside. People wanted the issue of our neutrality raised – in the context of what has taken place in Syria and what is ongoing in Gaza and at Shannon Airport, especially so in light of our joining PESCO, the EU’s Permanent Structured Cooperation in security and defence (i.e. an EU army?). The EU Parliament’s Brexit co-ordinator, Guy Verhofstadt, has said that the EU should be able to launch attacks like the one on Syria and France’s Macron said that the EU is “doomed to fail” if it can’t deploy military force under its own name. With PESCO, we are being sucked into an aggressive military alliance, Irish people are concerned, and we should be. Many respected journalists, including Robert Fisk, have said that there was no chemical attack in Syria – yet missiles costing in excess of $1 million each were fired, even before international inspectors could get to the site. It was noted that the share values at Raytheon, the manufacturer of cruise missiles, had increased by $5 billion since the attack was launched – someone is happy! In Gaza, children throwing stones are being shot by Israel’s brave army and countless resolutions of the United Nations disregarded. How does all this reconcile with what is happening at Shannon Airport? People in Cork are concerned about these events and it is proper that Cork County Council should at least discuss the matter, and maybe confirm our commitment to peace? At the start of the meeting I proposed to overturn the Mayors decision and, after some heated debate, I succeeded – a little victory. 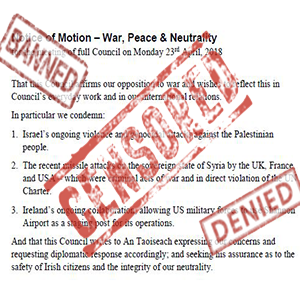 However, when time came for the discussion a disgraceful fudge was agreed, members adopted the anti-war policy but REFUSED to write a letter to An Taoiseach. A combination of Cllr Joe Harris (Social Democratic Party) and the obedient members of Fianna Fáil and Fine Gael decided not to express our view to Government. Cork County Council conducts international relations, every year money is spent sending delegations abroad, especially on St. Patrick’s Day; we have twinning arrangements with places in the USA, France and the UK. Are we to stay quiet about war crimes, about mass murder, about breaches of international law in order not to upset our foreign friends – what kind of friends would demand such silence of us? Perhaps there are no demand, are we willing slaves? Either way, shame on Joe Harris and the Social Democrats, and shame on the members of Fianna Fáil, Fine Gael – but isn’t this what we have come to expect?